Noble has developed ultra-precise Vishay resistor modules with a TCR of + 0.05PPM. Noble UHPR modules have cryogenically-treated 99.9999% solid core pure silver wire solder leads and a thin Teflon PTFE resistor casing. Built to improve of the sonic signature in any critical audio path, Noble makes Vishay's latest UHP technology practical and available to the audiophile. Increased audio transparency in critical audio signal paths. Reduced noise in applied circuit paths. More natural sonic signature in applied circuit paths. temperature coefficient (TCR) and precision tolerances to + 0.01%. .2" or .4" lead spacing. Lead lengths 1" nominal. Optional longer lengths available, also with Teflon sleeving. TCR of + 0.05 PPM/deg C.
TCR is defined as Temperature Coefficient of Resistance. 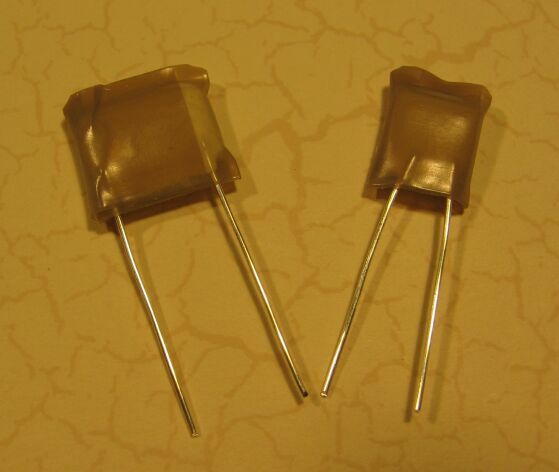 TCR refers to the change of the resistors value in relationship to the change of temperature. The lower the number the lower the resistance drift due to temperature change. As an example a resistor of 10,000 ohms with a 100 PPM TCR will change 1 ohm for every 1 degree C of change in temperature. A 1 PPM part will change only .01 ohms per degree C of change. The Noble Vishay parts will only change .0005 ohms per degree C of change. That is, as the circuit warms up, it does not effect the integrity and stability of the circuit. Power coefficient due to self heating is 5 PPM/ 0 to 1/2 load. Power Coefficient or Wattage Coefficient of Resistance is the change of the resistance due to self heating from no load to approximately 1/2 load. If the current in the circuit is changing the resistance will change as a result of self heating. No matter how low the TCR is, if the Power Coefficient is not low the resistor will drift with this self heating effect. Load-life stability is the characteristic most relied upon to demonstrate a resistor's long-term reliability. Vishay's UHP design significantly reduces the resistive component's sensitivity to ambient temperature variations and applied power changes. By providing a high degree of accuracy in fixed-resistor applications and significant reduction of the resistive component's sensitivity to ambient temperature variations and applied power changes, the Noble-Modified Ultra-High-Precision Resistor Modules result in quieter, more transparent and natural sonic character in critical path audio circuits. Noble Electronics has made Vishay's UHP technology available to audiophiles in a useful package with high-end features. Call or email for pricing and delivery.